There were 236,000 dollar millionaires, known as dakuan, in China, in 2005 and more than 250,000 in 2006, compared with 2.7 million in the United States. China far more millionaires than in India and Russia combined, and the number is growing at a rate of 15 percent a year. By one estimate around six or seven million Chinese, about 5 percent of the population, had assets of $100,000 in the mid 2000s. This is considered rich by Chinese standards. As of 2004, there were an estimated 10,000 Chinese with assets over $10 million. As of 2007, the richest 800 people in China had an average net worth of $562 million. In Deng era someone who rose from humble origins to a position of great success was called "a golden phoenix flying from a pigeon's nest” and nouveau riche were called "red eyes." Today, rich Shanghaiese are sometimes referred to as “old carats.” The rich wives club is a reference to groups of women that come to Shanghai to shop from Nanjing, Wenzhou, and other entrepreneurial centers in Zhejiang. It is assumed many rich Chinese are government officials or at least are politically connected. It is hard to come up with hard figures though. “If someone is a rich man, you can assume he has a government background,” Jimmy Wu, founder of a chemical company in Dongguan, told the Washington Post. 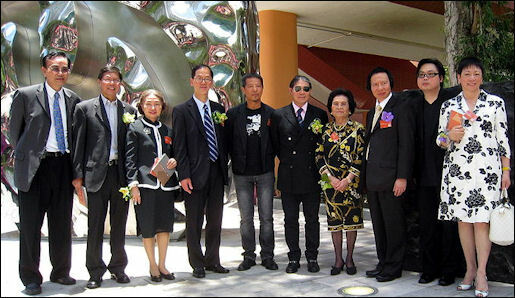 In July 2008, Chinese investment fund manager Zhao Danyang of the Hong Kong-based Pureheart China Growth Investment Fund paid $2.1 million dollars in an EBay charity auction to have lunch with American billionaire Warren Buffet. At the time it was the most expensive charity auction ever held on E-Bay. The money went to the Glide Foundation, which provides social services for the poor and homeless in San Francisco. Zhao and seven others had lunch with Buffet at Smith &Wollensky steakhouse in New York. Good Websites and Sources: Hurun Report hurun.net ; Hurun Report Rich Listhurun.net/richlisten ; Forbes Rich Chinese List forbes.com ; Hong Kong and Taiwan Forbes Rich List forbes.com ; Expert: Huang Yasheng, who teaches at the Sloan School of Management at the Massachusetts Institute of Technology, is an expert on Chinese entrepreneurs. 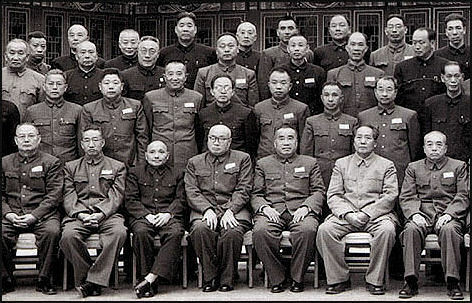 In the Mao era, the privileged Communist elite was made up of members of the Politburo, their staff, technocrats, bureaucrats, government engineers and lawyers. Many were Communist Party members. Some had peasant origins. Heros were Olympic athletes, and model miners and railway workers. The Communist party elite enjoyed access to special restaurants, hospitals, vacation homes, and stores with a reasonable selection of consumer goods. Perks included the highest paying jobs, first dibs on desired goods, cars with drivers, money, travel privileges, fresh fruit and choice cuts of meat unavailable to ordinary people. Their children and grandchildren were ssometimes admitted to universities without having to take the difficult entrance exams. The members of the professional class included writers, artists, senior professors, scientists and doctors. They had university or technical school degrees. Foreigners were a privileged class. They owned cars and apartments and enjoyed food and luxuries that no ordinary Chinese could afford. In the five years to 2009, sales of luxury cars in China rose five-fold, de luxe villas seven-fold and luxury goods tripled. This was just the start of a spending splurge: the number of wealthy households is forecast to double again by 2015. Rising property prices and a fast-growing GDP have been the key drivers for the rising number of Chinese millionaires, according to the report. It found that 55 percent of Chinese millionaires derived their wealth from private businesses, and 20 percent are property speculators who have ridden the fast hike in home prices. About 15 percent are stock gurus, while the remaining 10 percent are high-earning salaried executives. Housing prices rose across the country by 13.7 percent in 2010 according to government statistics, with luxury property prices rising even faster. High-end property prices in China's leading financial metropolis Shanghai, for instance, grew 21 percent last year, according to figures from UK-based Knight Frank, one of the world's largest commercial and residential estate agents. Despite the Chinese government's efforts to curb property speculation and control rampant housing prices, "the overall confidence of China's millionaires in the property sector and China's overall economy remains very high," said Rupert Hoogewerf, chairman and chief researcher of Hurun Report. "The impact (of the tightening measures) may be on excessive new wealth creation, but I don't think it is going to affect very much the (rich's) appetite for luxury products," said Hoogewerf, known in China by his Chinese name Hu Run. "For most luxury brands, the Chinese luxury consumers are now No 1: either representing the biggest market share or the fastest-growing," he added. Of the 960,000 millionaires, 60,000 have been identified as China's super rich with 100 million yuan or more in wealth, up 9 percent year-on-year. Beijing led the way with 10,000 residents boasting 100 million yuan or more, followed by Guangdong province with 9,000 and Shanghai with 7,800. The three places also led in the number of millionaires with wealth of 10 million yuan or more. According to the report, Chinese millionaires average 39 years old, a full 15 years younger than their Western counterparts. Thirty percent of the millionaires are female, the same as last year. The report also put the number of China's billionaires at 4,000, but only a third were on the Hurun China Rich List 2010. "(It suggests) there is still a great deal of hidden wealth in the Chinese economy," said Hoogewerf. Bugatti in China Early in the Deng era many tycoons in China made their money through real estate, Chinese medicines, investments and construction or took advantage of early privatization and restructuring programs launched in the late 1970s and early 1980s. Almost a prerequisite to getting rich was having some kind of connection with the Communist Party, possessing skills at navigating through bureaucracy and having a knack for forming friendships with key officials. With so many fortunes made from government contracts and with funding from state-run institutions it has been said that getting rich in China is not a matter of know-how but of know-who. Often the secret is befriending the right officials and pushing the right buttons---whether they be perks, deals or outright bribes---to get their approval. Many have got rich through less than legitimate means. According to an article in the China Business Times, early in the Deng era Beijing residents recognized several kinds of rich people. "red hats" government officials who took bribes; "yellow hats" pornographers; "blue hats" smugglers; and "white hat" drug dealers. The accumulation of wealth is no easy task. There are lots bureaucratic obstacles and corrupt officials who want a cut and are willing to be spoilers if they don’t get it. Many millionaires rode high for a while and then found themselves in jail. beautiful Chinese woman Some pioneering businessmen were political prisoners or criminals in the 1970s and 1980s who were forced to go into business because they didn't belong to "work units" and were unable to get regular jobs. Mou Qizhong, the owner of China's sixth largest private company in the mid 1990s, is a former glass factory worker who narrowly escaped a death sentence in the Cultural Revolution and was imprisoned in 1983 for profiteering. After he was released he made a small fortune from selling clocks. In 1992 he arranging a barter deal in which 500 railroad cars filled with Chinese-made consumer goods were traded for four Tu-154 airplanes and then used the planes to found Sichuan Airlines. His company had $1.1 billion in assets in 1995. At that time he began work at 5:00am and worked seven days a week. Millionaire Yang, made his first fortune by encouraging customers in southern China to replace their boring white mosquito nets with brightly colored and patterned ones. Three years after hatching this idea he was a rich man. The Mongolian Niu Gengheng turned his passion for cows into the largest dairy products company in China. Zeng Weili, an entrepreneur who rode around southern China on a bicycle in the mid 1980s selling shares for his company, created the Baoan Group, a conglomerate that controlled $675 million in assets in 1995. At that time the Baoan Group had stakes in 67 business and 37 joint ventures, including partnerships in chain of Peking duck restaurants, a pharmaceutical firm and a large Beijing department store. The company had offices in Hong Kong and Los Angeles and was beginning to venture into the movie business but was also trying to raise $60 million in cash to pay off angry bondholders whose bonds had come due, and prop up huge real estate projects that were in trouble. Soon she expanded into ferry trips to Shanghai, needles, thread, elastic, buttons and was able to make two yuan a day, ten times the state wage. When officials first came to her house she feared the worst but was told what she was doing was alright in light of new reforms. The official said all she needed to do was fill out some forms and provide two photos and she could be legitimate, She was still hesitant, worried about what would happen if the policy changed and she was an record as being a capitalist. wedding fleet One Beijing businessman told the Los Angeles Times, “Chinese people are suspicious of anyone who gets rich. They think the only way to get rich is to know somebody and be in on an inside deal.” According to a 2011 edition of the respected Hurun Report, the richest 70 of China’s parliamentarians boast a combined wealth of 493.1 billion yuan ($75.1 billion). By contrast, the assets of the 70 most well-heeled members of the U.S. Congress add up to no more than $4.8 billion. In 2001, Yang Bin was listed by Forbes magazine as the second richest man in China, with a net worth estimated at $900 million. He was the founder of the Hong Kong-listed orchid grower Euro-Asia Agricultural Holdings and was appointed by Beijing to run a special economic zone in North Korea. In November 2002, he was placed under house arrest on tax evasion charges. In July 2003, he was sentenced to 18 years in jail for contract fraud, bribery, illegally occupying farmland, and forging financial documents. Zhou Zhenghyi is a Shanghai tycoon and former snack-shop owner who was once listed as the 11th richest man on the Forbes China list with a fortune of $320 million. In 2007, he was sentenced to 16 years in prison on corruption charges and for faking documents and illegally using bank loans to speculate on the stock market. Wang Xuebing, the head of the Bank of China, China’s second largest bank, was investigated for a questionable $23 million loan linked to Wang's wife. Zhiu Yiming, the youngest person on the Forbes list of the richest people on China in 2005, was sentenced to life in prison for bank fraud. He is said to have forged financial reports to obtain a $48.5 million loan which he used to acquire a stake in major water and electricity supplier. Pan is not only one of China's wealthiest people but also one of the country's most-celebrated "Big V" bloggers, with nearly 17 million followers on Sina Weibo, at times drawing attention from the authorities. Zhang told the Wall Street Journal that the firm's "SOHO China Scholarships" will be aimed at encouraging less-well-off Chinese students to apply to study abroad. Nonetheless some users of Sina Weibo, a Chinese Twitter equivalent, sharply criticised Pan and Zhang, questioning the couple's motives and arguing that disadvantaged students within China are more deserving of help. "They despise their own country and people," one Sina Weibo user wrote. "It doesn't matter... The rise of China and Chinese higher education is historically inevitable," added the poster, who uses the name "Boycott Japanese goods forever". Another user added: "Taking Chinese people's money and giving it to people who are able to study in America -- what a great definition of 'poverty'!" Others defended the decision by the couple, who have also established a foundation to support education in rural areas of China. "A lot of people are saying Pan Shiyi and his wife spent $15 million to buy their son a ticket to Harvard. However, we shouldn't find fault with how they decide to spend their own money," wrote one. “Zhang responded to the criticism on her own Weibo account, writing that without funding for poor students, good education would be reserved for the wealthy. "Our scholarships will change this phenomenon," she wrote. Pan has previously driven public opinion online on a variety of issues, and incurred the government's wrath by posting details of Beijing's dirty air levels, which at the time were not officially released. At a meeting in mid-August, one of China's top officials responsible for Internet censorship told Pan and other well-known bloggers to be "more positive and constructive" in their online comments, according to the state-run Xinhua news agency. Pan was later shown in an interview with state broadcaster CCTV, where he appeared contrite and warned of the dangers of "casual" online posts. “But the giddy atmosphere fell apart when it was announced that the tycoon would not be handing out the cash, at the behest of the Mission, which was concerned the money would be used on drugs and alcohol. After the announcement, several people tried to rush at Chen, who was shielded by guards, while others shouted insults at him, media reports said. Speaking to the South China Morning Post, a member of the event’s organising team described the scene as “weird and troublesome”. “Chen could have organised the luncheon in a better way,” the organiser said, requesting anonymity. “At least he did not have to bring all those military uniforms – [viewed as] Halloween costumes [by] the Americans – and asked his volunteers to put on the uniforms and sing a patriotic song,” she said. Craig Mayes, executive director of the New York City Rescue Mission, was left to deny there had been any injustice. “I’m really sorry. It was misrepresented in the paper,” he said. Michelle Tolson, director of public relations at the Mission, said Tuesday that no cash would be handed out to individuals and that it had taken 1.5 months of negotiations to convince Chen to instead donate $90,000 to the group. The money would be ploughed straight into the Mission’s $5 million yearly expenses to feed and house people, she said. The shelter provides people with a hot meal, a clean shower and a safe bed, clothing and assistance in addressing their problems. Known for publicity stunts, Chen made headlines a few months earlier when he tried to buy the New York Times. In 2014, he was is listed at number 227 on Forbes’ list of the 400 richest Chinese, with an estimated wealth of US$825 million. “Hopefully, I will really lead the way to encourage other people who are in a position to help to follow through,” he said before the homeless people dinner. Chen, however, seemed unfazed. As he made his exit, I asked him what he thought of the event. "I'm very satisfied," he said with a smile. "China is rich, and America is rich, and this was very successful in development of my U.S. philanthropy." His next plan, he told me, was to do an event distributing money somewhere in Africa. And Chen wasn't the only one who left feeling satisfied. To Audible Chocolate, the charity was appreciated. "They paid us decent, and it came at a great time," said Anderson. "He made it rain." In early 2012 state media reported that Lin had taken over a Delaware-based bank for $60 million, and the unprecedented acquisition brought him praise and a political appointment to a municipal advising body. Overseas acquisitions are a point of pride in China, showcasing its rising economic power. Lin's supposed purchase of an American bank was particularly appealing because it signaled both Chinese triumph and U.S. decline. The story attracted so much attention that Chinese journalists familiar with U.S. banking regulations checked into the legitimacy of Lin's claims, and the bank turned out to be nonexistent. By June, Lin was arrested on suspicion of the tax fraud. In 1978, Xue was accepted to the Chinese Academy of Social Sciences, he entered UC Berkeley in 1980, and he made the acquaintance of Masayoshi Son, Lu Hongliang, and Stan Lai. Before graduating, Xue got the job in New York. In June 1991, Xue returned to Beijing, he founded Unitech with Lu Hongliang and Wang Zuguang. In 2011, Xue founded 8848 Electronic Commerce Network. In 2008, Xue settled back in Beijing with his wife and children and later became a popular blogger and one of China’s best-known venture capitalists. Xue is an avid blogger who has attracted 12 million followers with his reform-minded comments. Shortly before his arrest he posted a message on China's hugely popular Twitter-like Sina Weibo microblog site. He has previously backed a campaign to release transparent details on pollution in China, and also highlighted the problem of child trafficking. His detention dominated weibo discussion, with his Chinese name Xue Manzi the most searched phrase on the day of his arrest. Beijing police said on their verified weibo account they had arrested a 60-year-old man surnamed Xue and a 22-year-old female. "The two of them candidly confessed about the prostitution. They are currently under administrative detention," the statement said, adding that the arrest followed a tip-off from local residents. The arrest come after authorities told internet celebrities with millions of online followers to "promote virtues" and "uphold law" online.” Xue apologized for visiting prostitutes and spreading negative information online, making a pub;ic confession on Chinese television. He had yet to be set free, or charged, more than five months after being detained. In April 2014, he was finally released. According to the Economist, “Mainland China offers scant legal protection for private property. The rich, many of whom cut corners to get that way, know they could lose it all suddenly. Many also fear losing their political patrons next autumn, when China’s Communist Party will anoint a new generation of leaders. Small wonder they are seeking havens for their money and their families. According to the Hurun Report, a wealth researcher, some 14 percent of rich Chinese say they have already left the country or are filling out paperwork to obtain a foreign passport. Another 46 percent are considering one of these steps. A recent report by Bank of America Merrill Lynch warned about the destabilising effects of “hot money” speeding out of China this year.